Creating a book is no easy task. Yet by working with CorporateHistory.net, it became an endeavor of excitement and love. Marian Calabro was an invaluable organizer and writing partner. She became a friend to Melwood as well, embracing our story as if it were her own and easing all of us through this challenging process. The book’s positive reviews owe a lot to her skills and commitment. As a professional writer myself, and a person who knows Melwood and Earl Copus well, I can only say that I marvel at Marian Calabro’s work. She has not only written a great story into a fast and enjoyable read, but she has organized 40 years of content and documentation beautifully. This hardcover book blends organizational history and nonprofit management wisdom from Melwood’s president emeritus. Melwood provides job training, employment, and recreation to more than 2,100 adults with Down syndrome and other developmental disabilities. Almost 85 percent of Melwood’s budget is self-earned, a remarkable achievement in the not-for-profit sector. A pioneer in the area of horticultural therapy for people with disabilities, Melwood branched out to become a leader in social entrepreneurship. Earl Copus guided Melwood from a humble volunteer effort to an international success story. People in the nonprofit world long urged him to write a book about the journey. Overflowing with 40 years of stories and “lessons learned” as Melwood’s CEO, but less experienced as a writer, Earl turned to us for help. He had drafted more than 100 pages, but he felt stuck. We worked with him to smooth out his prose, maximize his writing time, and organize his abundant material into the book he envisioned. Part One shows how Melwood’s innovation and sheer determination tore down barriers against people with disabilities. Part Two is a tool kit for nonprofit professionals in all fields and the families and friends of people with disabilities. Part Three offers 50 pages of hands-on resources. 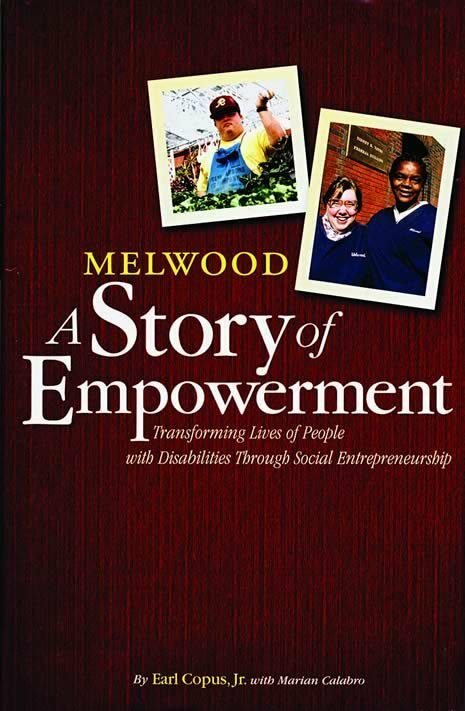 Coauthors: Marian Calabro and Earl Copus, Jr.
Award Winner: Melwood—A Story of Empowerment won an Apex Award of Excellence for custom publishing. Sponsored by Communications Concepts, Inc., these awards are based on the quality of graphic design, editorial content, and communications excellence. The competition drew almost 5,000 entries, with just 52 winners in the custom publishing category. “This book should be required reading for every person who has a loved one with developmental disabilities. You will identify with and cheer the wonderful people stories.”—Lorraine Sheehan, past president, The Arc of the U.S.